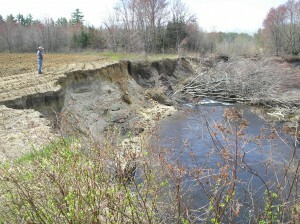 ← State of Milfoil in Winnipesaukee – 50 Yrs. Later! Why Do Rivers Do That? —-The New Hampshire Rivers Council Annual Meeting and Evening Program on Thursday, July 30th beginning at 5:30 and 6:30 PM respectively – Don’t miss out on your chance to chat with others about sinuosity, meander belt widths, equilibrium, large wood, and all things fluvial! So…why do rivers do that? With recent and historic flooding, landslides, and avulsions in our area, it seems that rivers do wild and inexplicable things—but are they really unpredictable? Can we prevent these catastrophes? Should we? Dr. John Field, an internationally known expert in the growing field of fluvial geomorphology, will present the exciting and interesting program that provides geological and recent history of river dynamics in our area. He will answer questions about everything you wanted to know about rivers but were afraid to ask! Plus, at your next cocktail party, you can say you know a Fluvial Geomorphologist…how cool is that? 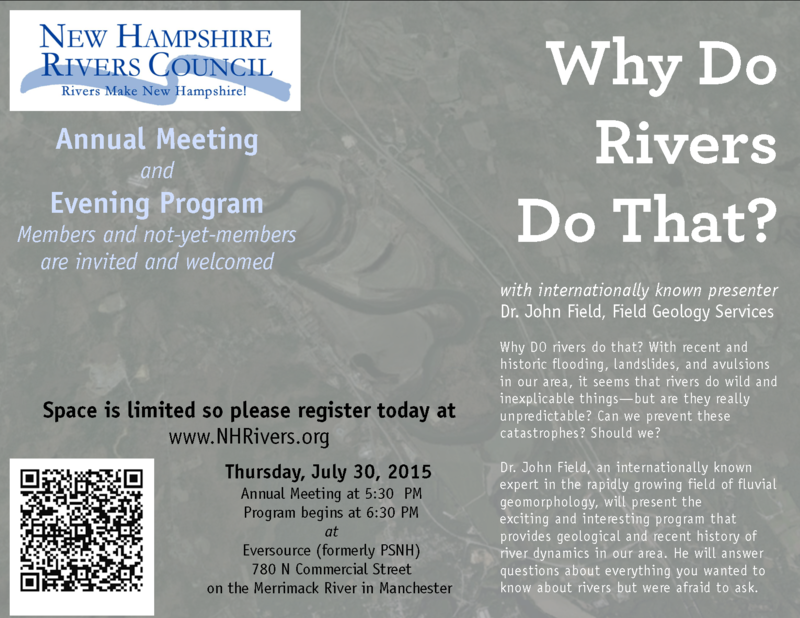 The New Hampshire Rivers Council Annual Meeting begins at 5:30 PM with the Why Do Rivers Do That program getting underway at 6:30 PM. New Hampshire Rivers Council members and not-yet-members are invited and welcome to attend both events. This fantastic evening will take place at Eversource (formerly PSNH) on 780 N Commercial Street right on the Merrimack River in Manchester, NH. 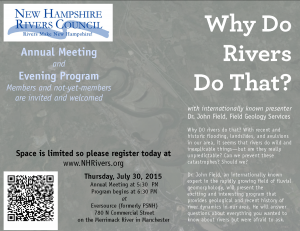 Space is limited so please register today at www.nhrivers.org. We hope to see you there! This entry was posted in Announcements/Events, General, Public Involvement/Outreach, Watershed Protection (High Quality Waters), Watershed Restoration (Impaired Waters), Watershed-based Plans. Bookmark the permalink. One Response to Why Do Rivers Do That? —-The New Hampshire Rivers Council Annual Meeting and Evening Program on Thursday, July 30th beginning at 5:30 and 6:30 PM respectively – Don’t miss out on your chance to chat with others about sinuosity, meander belt widths, equilibrium, large wood, and all things fluvial!